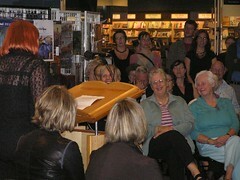 Women of the Gobi was officially launched at Reader’s Feast bookshop last night. “I ask my wife what ‘launch’ means, she tells me it’s like the pushing out of the boat into the sea,” my French friend Thierry said, after arriving late as usual. Unfortunately I couldn’t break a bottle of champagne over my book to launch it on its journey into the ocean of bookshops (the analogy’s breaking down a little, isn’t it?) because I was staying away from alcohol – I put my back out in the morning, and I was full of anti-inflammatories and painkillers (which would have combined quite nicely with a drop of red, but not a good idea when I had to give my first public speech since my Nana’s funeral six years ago). Lonely Planet co-founder Maureen Wheeler talked about Women of the Gobi, and how it reminded her of missionaries she used to hear speaking at the YWCA in Belfast in the ’60s, and how that may have contributed to her desire to travel the world. Then I read a bit from my prologue, and tried to disguise the fact that I was shaking. There were more people there than I expected (thanks everyone!) – Tasmin estimated 150 but that may be a tad generous. Then I had that glass of red, and as expected it was indeed a nice buzz, but I had to sign a bunch of books and I scrawled illegibly and wrote some slightly silly things in them. Sorry everyone. It was fun, if slightly nerve-wracking. Highlights of the night: watching a certain Noble Prize nominee flipping through the new Robert Hughes autobiography trying to find the dirty bits; my mum hassling Philippa Hawker (‘So are you going to review it for the Age? Are you?’); seeing my beautiful niece Adela; hearing everyone who had already read the book asking my brother Jack why he wasn’t wearing his hat. Here’s a couple of pics. 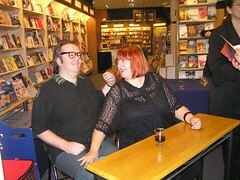 That’s me taking a break from book-signing to fondle Chris – I’m not sure I knew a photo was being taken. Here‘s where to buy the book! My dad has a volunteer job teaching English to migrants. Of all his students from around the world, he particularly likes and gets along with twos Iranians, a middle-aged Muslim couple. And being who he is, he recently lent them a copy of the Jesus film on DVD. The next week they returned the film, and thanked my dad. And being well-mannered people, they loaned him a DVD in return. March of the Penguins. My parents stayed in and watched the penguin movie on Saturday night. They liked it. Whether they appreciated it more or less than the Iranians enjoyed the Jesus film is impossible to say. “Actually Chris and I stayed in and watched Dr Who,” I said. Which is true, and made him feel better. You are currently browsing the KateJames.net blog archives for October, 2006.